Flow charts, also called process maps, are used in business process management to visually depict the steps in a process. Standards exist across boundaries of industry and functional area so that once one learns the basics of reading a flow chart, one can read them in a variety of contexts. One aspect of this standardization is the use of specific shapes or icons to indicate specific types of steps, activities or objects in a process. The starting point and ending point for a process are indicated using a rounded rectangle. These points are called terminators, and indicate the boundaries of the process under examination. A brief phrase describing the beginning or ending state is shown within the shape, such as "agent's phone rings" and "agent saves contact record" for a customer service call flow. 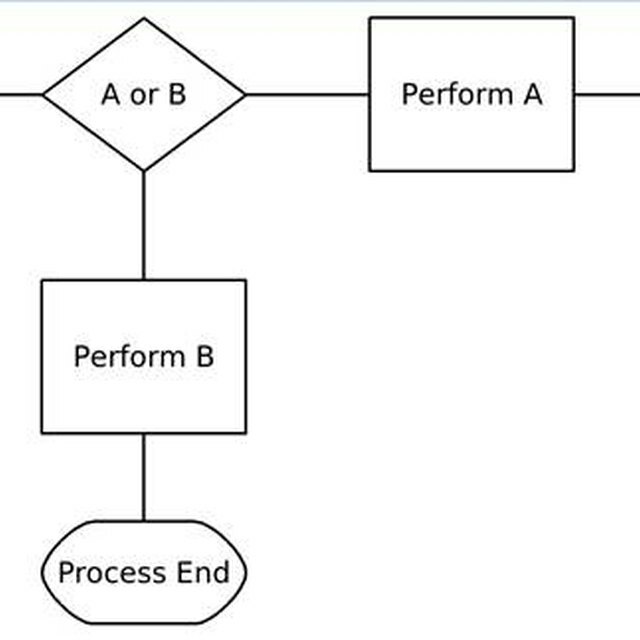 For many processes, a flow chart will include primarily a series of basic steps or actions, with an occasional decision point or other element. These basic activities can include a vast array of actions such as making a phone call, entering data onto a form or modifying an object. They are indicated using a rectangular icon. A brief description of the step is usually shown within the rectangle, such as "agent calls supervisor" or "employee submits evaluation form." Processes are often more complicated than a sequential series of steps always performed in the same way for all situations. Typically there are one or more branches or decision points in the process where the subsequent step is depending on either a human decision, an automated calculation or the output of the prior step. These decision points are illustrated with a diamond shape labeled with an explanation of the decision such as "is service center open?" or "is copier out of paper?" What Are the Elements of a Flowchart? What Is a Control Transfer in a Flow Chart? The flow line is the most extensively used shape in a flow chart, as it depicts the flow of activity throughout the steps and, for some charts, among different individuals or groups. This simple one-directional arrow shows the viewer the order in which steps are conducted. In the case of decision points, the lines are labeled to indicate which direction is appropriate for a specific decision, often simply with "yes" for one and "no" for the other. Flow charts for more complex processes may not fit on a single page. Thus a symbol is necessary to indicate when additional steps and information are on a different page. The symbol shown here is the standard symbol for an off-page reference. In software programs for creating process maps, the shape also serves as an active hyperlink for the page where it leads. Many business processes involve paperwork such as reports, forms and other documentation. Evaluating the efficiency of these processes can be a major component of process improvement initiatives. The icon shown here is used to indicate a document that is associated with a process. Many standard icons serve to represent a variety of other elements in a flow chart. 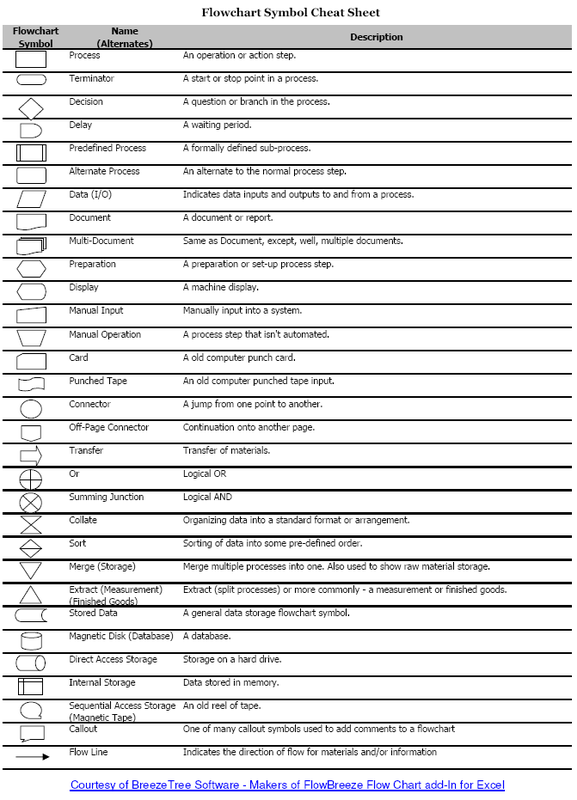 Some of the elements represent types of hardware, such as a direct storage device or tape backup, others represent a specific type of process such as sorting or collating, and others represent "or" or "and" conditions.